college costs are a big deal. We’re so confident of the value of a Ouachita degree that we back it up with a promise: If your income after graduation is less than $43,000 annually, you will receive help repaying your educational loans. This Loan Affordability Pledge is available to those who apply and are accepted to first enroll at Ouachita in 2019, and who are among the first 120 to pay the enrollment deposit and sign to accept the LAP award. One of the most important life decisions you will make is where to attend college. At Ouachita, we strive to provide the best educational environment possible. 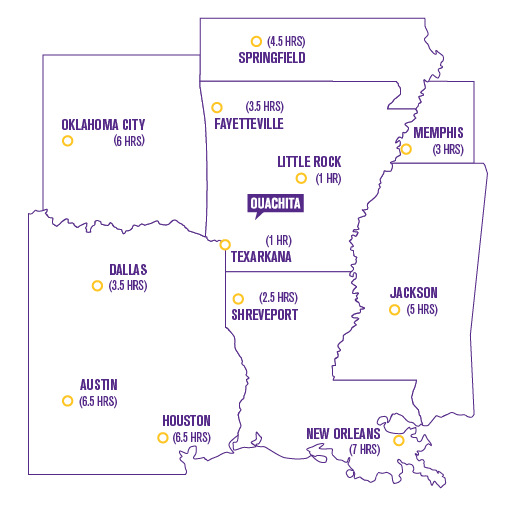 For many families, an investment in Ouachita is one willingly made in order to provide the very finest education in a setting that integrates faith and learning, and that supports and extends the foundation laid by your family and church. But what if your family is concerned about how you will pay for college and you’re worried about the long-term implications of borrowing money through student or parent loans? The idea of loan obligations after graduation weighs heavily for many, sometimes even leading students away from their first-choice university. On average, Ouachita graduates leave the university with less debt compared to state and national borrowing rates, but for many the concern remains. Ouachita understands. More importantly, Ouachita is doing something about it. Sign and accept the LAP award. The pledge covers student and parent loans of all types certified by our Student Financial Services team including Federal student loans, private alternative student loans, and parent PLUS loans. Transferring to Ouachita from another university? Contact Student Financial Services at 870.245.5570 to see if you qualify for the Loan Affordability Pledge. The covered loans cannot exceed $17,000 in any academic year, nor $70,000 in aggregate and must be on a minimum 10-year repayment schedule. Must be employed in the United States averaging a minimum of 30 hours per week. Must have an income below $43,000. Those earning less than $20,000/year are eligible for full assistance, meaning the full loan obligation will be reimbursed by LRAP. Those whose income falls between the upper and lower thresholds will be eligible for proportional assistance. The assistance will continue until the loans are repaid or the graduate’s income increases above the upper income threshold. Must initially qualify by the end of the full calendar year after graduation. Graduates may defer the end of the benefit window indefinitely to attend graduate school or for up to three years to work internationally. No essay. No application fee. No place like Ouachita. – First, you will need to apply to Ouachita. Only accepted students who have paid their enrollment deposit are eligible for this special program, limited to the first 120 students. Click here to apply. Once you are accepted, you will need to pay your enrollment deposit online through your Info web portal or call Student Financial Services at 870-245-5570. Click here to pay your deposit through your portal. Once you’ve completed those two steps, you’re ready to sign up! Click here to sign up for the Loan Affordability Pledge through the LRAP Association (Loan Repayment Assistance Program). Visiting campus is the best way to get to know Ouachita. We would love to help you figure out if Ouachita is your perfect fit! Have a question? Want more information? Shoot us a message!